One look at the top drawer of my desk & you'd know that I'm a certified "Lipztickaholic" ;-) More than the usual suspects like night creams, moisturizers, lip balms, etc, you'd find lipsticks lying around. Last year, I became more organized thanks to the blog & began regularly rotating my makeup. I have now made it a point to keep only 5 lipsticks in the top drawer for easy access. If you're looking for an everyday matte shade that adds slight color to your face without seeming too bright, this is a great shade for you! It's subtle, 'rosy' makes it appropriate for work too :-) Don't let the name 'Powder Matte' scare you, it's not as 'dry' as the name sounds. Looks completely matte but is extremely comfortable to wear. Another scary name - Magenta! lol I was pleasantly surprised when I loved the pinky-purpley shade (gosh! where do I learn these words, I have no idea! Pinky-Purpley!!). 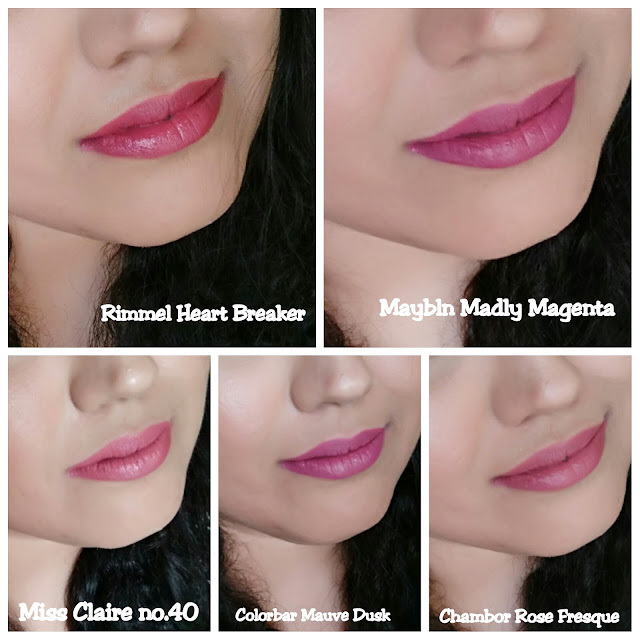 As the name suggests, its a creamy matte finish & I would definitely recommend it to someone who loves creamy lipsticks & is looking to venture into mattes. Also, someone who loves their mattes but would like to wear something that moisturizes the lips (Read..ME!!). So these are my 'Everyday shades' that I like to keep handy. In spite of being, simple & subtle, they have great coverage & will cover pigmentation (if any) on your lips. Note - I feel the hand-swatches haven't done justice to the shades; I clicked them in the harsh afternoon sun. 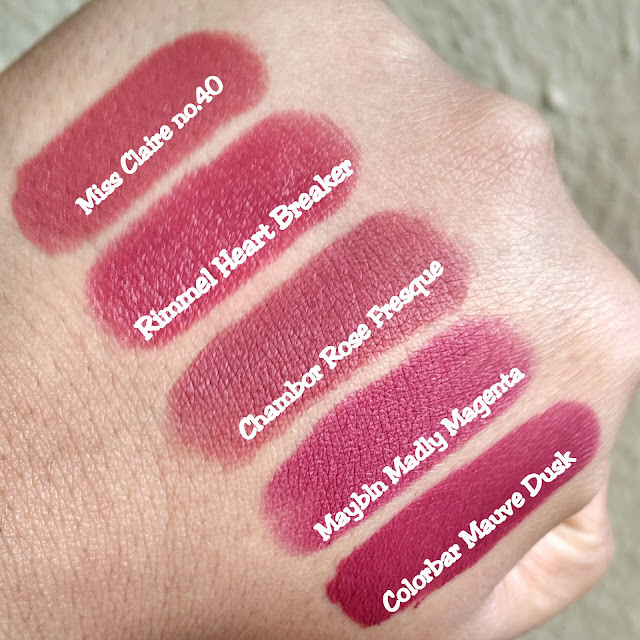 For the true color, plz refer to lip-swatches :-) Thanks! All these shades are pretty. Love Miss Claire and Chambor the most. 'Swatches haven't done justice'? Who told you so? You have killed it! In fact, I was actually admiring not only the intertesting assortment of colors, but also, how you swatches each and every color. Yay Nivi!! Wish we lived in the same city...We'd be raiding each other's lipstick stash ALL THE TIME!! Thank you for liking the swatches baby...mwah! Beautiful lipsticks Neha👌 I'm so tempted to buy that rimmel shade.